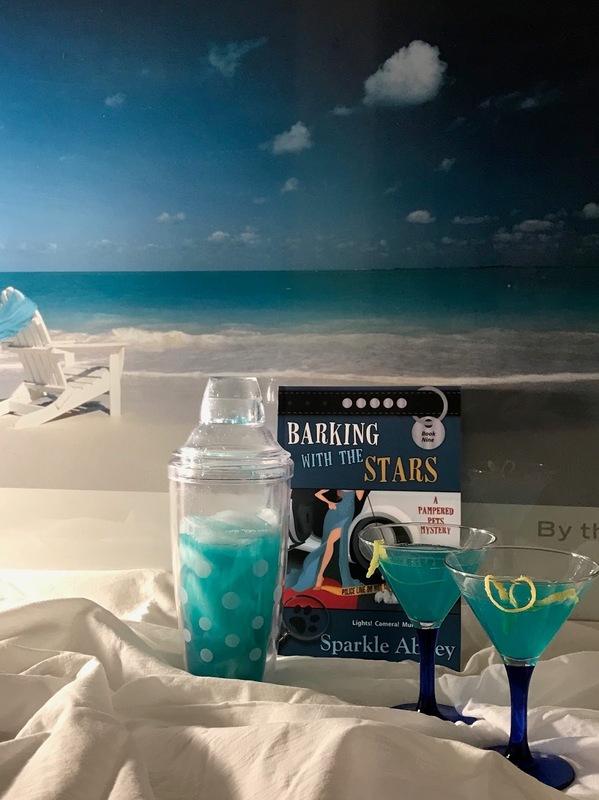 Sparkle Abbey's martinis have gone to the dogs, or rather their book, Barking With The Stars, has been matched with the perfect one. Sparkle Abbey is the pseudonym of two mystery authors (Mary Lee Woods and Anita Carter). They are friends and neighbors as well as co-writers of the Pampered Pets Mystery Series. The pen name was created by combining the names of their rescue pets-Sparkle (Mary Lee's cat) and Abbey (Anita's dog). They reside in central Iowa, but if they could write anywhere, you would find them on the beach with their laptops and, depending on the time of day, with either an iced tea or a margarita or perhaps a Deep Blue Sea Martini. Barking with the Stars takes place in uber pet-friendly Laguna Beach, California as do all of the Pampered Pets mysteries. The story features amateur sleuth and pet therapist, Caro Lamont, who has been asked by her best friend and former Hollywood silver screen legend turned animal advocate, Diana Knight, to assist with a benefit for Warriors for the Paws. The organization pairs therapy dogs with veterans suffering from post-traumatic stress syndrome. It’s a worthy cause and Diana doesn’t have to do much arm-twisting to convince Caro to help with the Barking with the Stars event, but from the get-go things begin to fall apart. Caro’s ex-husband, Geoffrey is spreading rumors about Caro and snuggling up to the biggest stars, including Purple, the temperamental diva and headliner of the celebrity event. All too soon, Caro is losing clients, her reputation, and patience with Geoffrey's shenanigans. More trouble is unleashed when the high-strung diva is found dead and Caro’s ex seems to be the prime suspect. With a potential killer on the loose, Caro is hounded by questions about who had reason to want Purple out of the picture. Though all the evidence points to her ex, Caro believes the police are on the wrong trail. Even if her sleuthing puts her in the doghouse with homicide Detective Malone, Caro must dig up the truth before the real killer gets away with murder. The Deep Blue Sea Martini is the perfect drink pairing for Barking with the Stars given the beautiful coastal setting, the views of the deep blue Pacific, and, of course, the star-studded attendees. It’s fresh and fruity, and guaranteed to make you yearn for a beach. Place all of the ingredients into a shaker with some ice and after a few shakes pour the bright blue liquid into a fun martini glass and garnish with a twist of lemon.